One of the main reasons many moms become work at home moms is because they want to spend more time with their children than they would be able to if they went to work outside the home every day. Some women take this a step further and become work at home, homeschooling moms. Working at home or homeschooling with little ones underfoot can be frustrating, but it doesn't have to be. 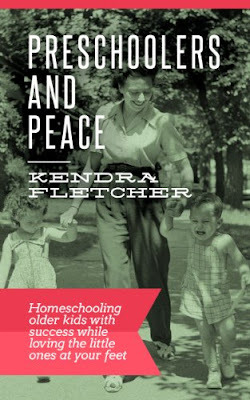 Kendra Fletcher, a mother to eight and a homeschooling mom for the last sixteen years (beginning when her oldest was 4), knows quite a bit about homeschooling with little ones. 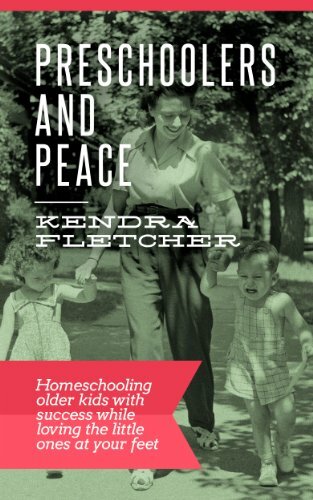 She is the author of the popular blog, Preschoolers and Peace, and now she is also the author of the e-book, Preschoolers and Peace: Homeschooling older kids with success while loving the little ones at your feet. If you're a mom to littles, whether you work at home, homeschool, or do both, you will likely find quite a bit of helpful information in this book. What's In Preschoolers and Peace? Fletcher makes it clear from the beginning of the book that what a mom most needs is God. She needs to trust in God and make Him an important priority in her life. If she does this, everything else will go much more smoothly. As a continuation of Chapter One, Fletcher reminds readers how important prayer is. She explains how she finds time to pray in her busy day and how praying regularly is also important to her children. When you're homeschooling with little ones around, flexibility is key. However, Fletcher also recommends having a lose schedule to follow. Her little ones have morning chores they're expected to do. Fletcher gives six things you must consider when creating your own schedule. Even more important, she shares her family's schedule. Chapter Four: How Do I Keep Them Busy? This is the million dollar question. This chapter alone is reason to buy this e-book. Fletcher gives many, many strategies to keep little ones occupied. Working mothers, homeschooling mothers, and just moms who need to make a phone call and have relative quiet would benefit from this schedule. Chapter Five: What Does a 2-Year-Old's Day Look Like? This chapter includes more activities to keep little ones busy with a focus on the toddlers. Chapter Six: How Do I Get Any Preschooling Done? Fletcher gently reminds readers that preschool doesn't have to be taught with a fixed curriculum. Instead, many daily activities can be considered preschool learning. This chapter is for moms of only littles who wonder what to do all day. Fletcher's advice, do the things you've always wanted to do like read the classics and learn to cook ethnic food, especially since time will become more scarce as your kids grow older. Using circle time is a great way to teach the family together. This chapter explains how to include little ones in this time. Boys are full of energy, and Fletcher wisely suggests structuring their time with activities so they don't create their own mischief. Fletcher gives strategies to bring sanity to your days like cooking in bulk, but really, the strategies in this chapter apply to moms of kids of all ages. How much do you expect of your child when it comes to chores? Fletcher reminds us that toddlers are often capable of much more than we think, and they enjoy having their own "jobs" around the house. Fletcher finds one of the most important lessons to teach young children is obedience. As they get older (and more mature), parents can ramp up the difficulty of their lessons. Fletcher has been pregnant, post partum or nursing for fifteen of her sixteen homeschooling years, so she knows quite a bit about this. She recommends that during this time, you give yourself grace and cut out the non-essential activities. *Affiliate links may be used to support the site. Opinions are our own.